So. true. Don’t you think? Occasionally our lives seem terrifyingly chaotic, as though we are spinning out of control. Do you ever feel that way too? I can really relate to this notion, especially lately. I feel like every day this past week has been a sprint from a-b without the chance to breathe! I couldn’t agree more with the message above. As you know, I have been a little pumpkin-obsessed lately. And here we go again! I am so excited to share this recipe as the third instalment of my Blue Owl Treats October Pumpkin Fest. Yes it’s a thing. OK!?…haha.. Alright let’s be honest.. I just need a way to justify all this overreactive pumpkin behaviour I’ve been exhibiting lately with an official title.. 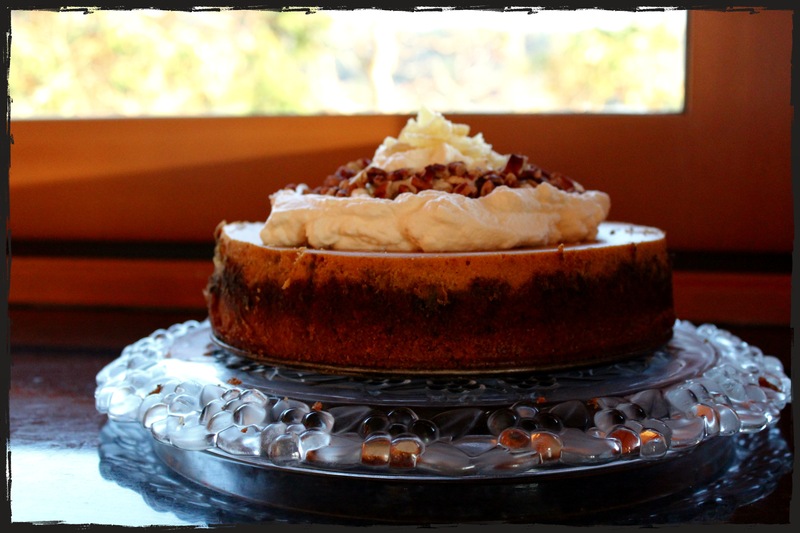 The cake was heavenly– in a creamy, gingery, autumnal kind of way. 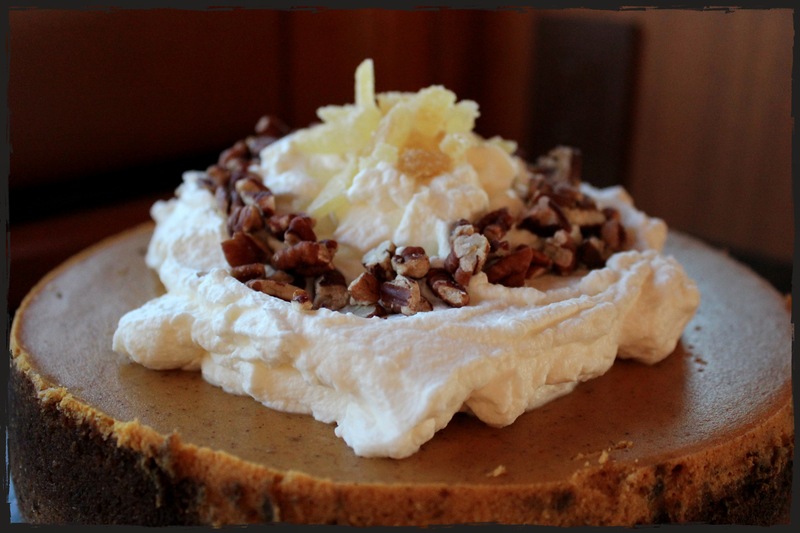 The butter-gingersnap crust enveloped a smooth, cheesy, spiced centre. 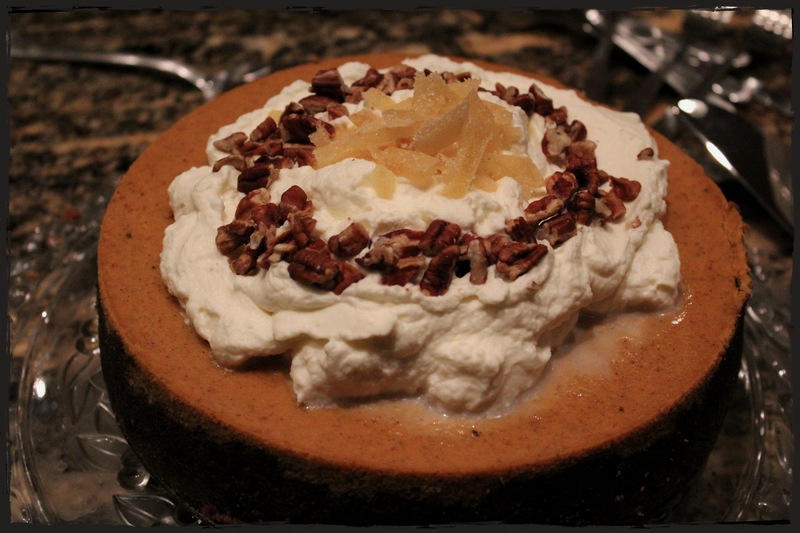 Of course Thanksgiving called for a dramatic dessert, and nothing out there compared to this cheesecake’s spin on Thanksgiving’s most traditional dessert- the pumpkin pie. To top it off (literally..), the cake had a fluffy cloud of whipping cream, toasted pecans and candied ginger slices garnished like a tiara on its centre. 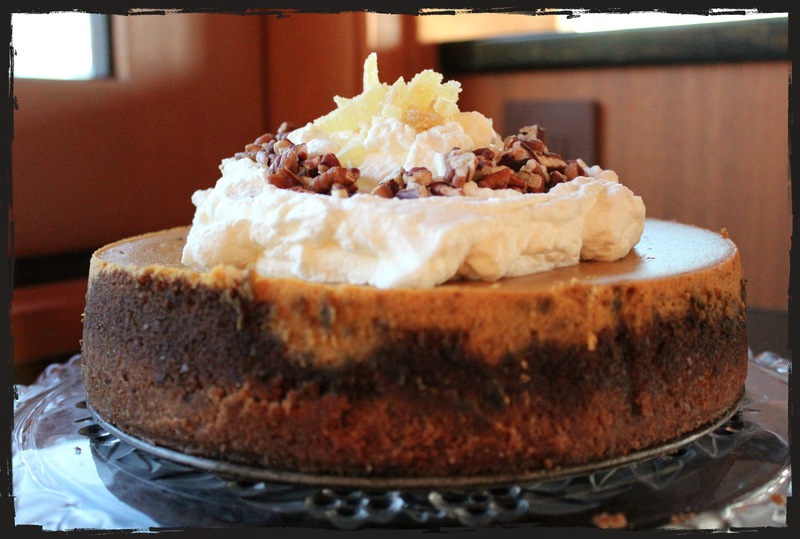 Yes, this cheesecake is utter dessert perfection for one of the most momentous North American feasts of the year! Yield: 1 10-inch cheesecake. Bake: 350F, 250F. Supplies: 10 inch springform pan. 1. Preheat oven to 350 degrees F. Prepare your 10 inch cheesecake spring-form pan by greasing all sides. Crush gingersnap cookies on a cutting board with a rolling pin. Mix all ingredients together in a bowl, adding the melted butter last. Mix until all ingredients are evenly combined, then press mixture firmly into your prepared cheesecake pan (You can use a small piece wax paper to help press down without getting messy hands.) Bake for 8 minutes, or until golden. 1. With an electric mixer, beat cream cheese, sugars and whipping cream until light and fluffy, about 8 minutes. Beat in the pumpkin, then beat in the eggs for 1 minute. 2. Mix the dry ingredients in a small bowl and sift together with a whisk. Add dry ingredients to the wets and mix together until only just combined. Pour the batter into the prepared crust pan. 3. Bake cake for 15 minutes at 350 F, then reduce temperature to 250 F and bake cake for 1 hour 10-20 minutes or until the centre is set and the top is no longer shiny. (Mine took longer than the recipe suggested, more like 1 hour 20 mins, but I have an oven that’s on the cooler side.) Turn oven off, and let cake cool in the oven. 4. Chill cake for 4 hours in the refrigerator, or overnight, covered in carefully wrapped saran (don’t let the saran touch the top!). 1. Set cooled cake on serving platter. Beat whipping cream, sugar and vanilla in an electric mixer on high until stiff peaks form. Dollop whipping cream in a fluffy mound in the centre of your cake. 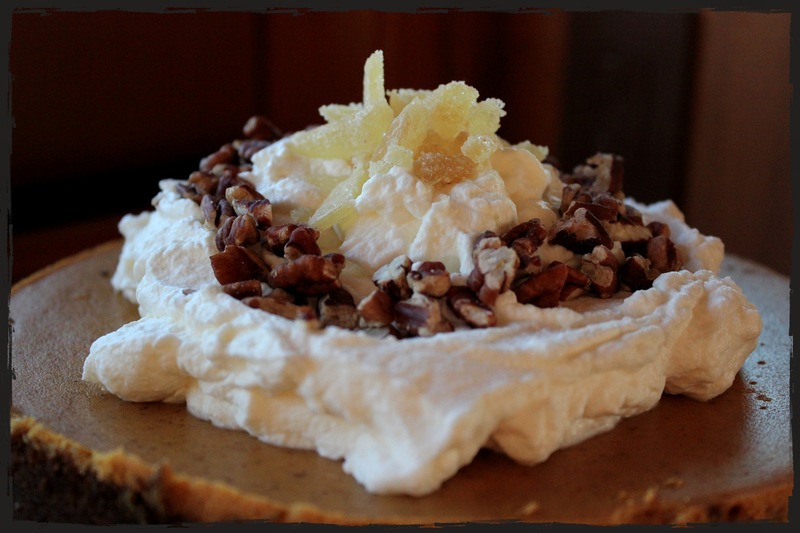 Garnish with a scattering of pecans and your candied ginger slices. Show off with pride. :) You just made a masterpiece! Recipe Credit: Wanda Beaver from Wanda’s Pie in the Sky. I hope you have a wonderful week filled with fast transit from a-b, productive afternoons and perhaps a few biscuits and tea just to make you feel like you again. P.P.S: A funny picture: How to make a bad day, right. 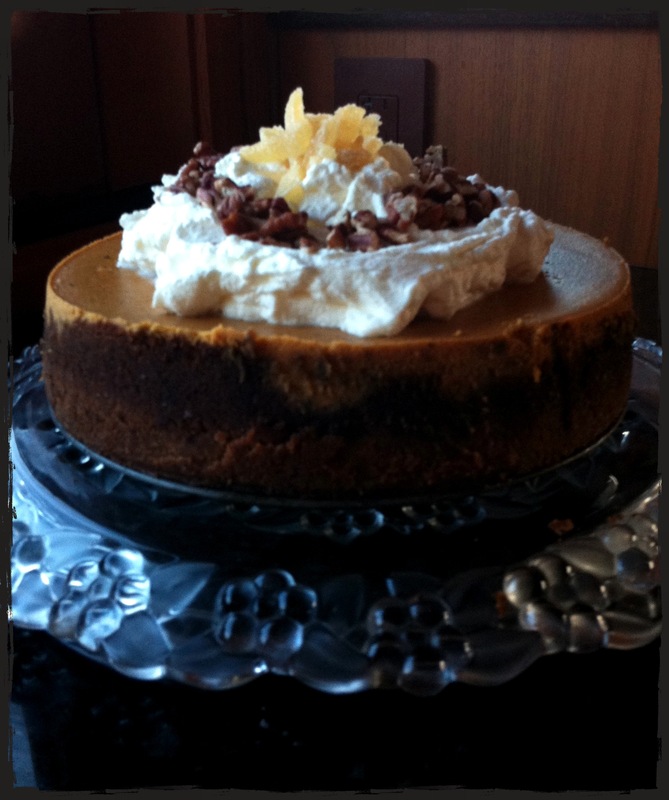 This entry was posted in Baking, Cake and tagged autumn, cake, cheesecake, dessert, fall, pumpkin, Thanksgiving. Bookmark the permalink. Well good thing we stopped for a cup of tea and breather/catch up session on sunday!